SPACE Anthology: Mutant Elf has arrived! Mutant Elf is a project I plan to continue, since it seems like such a neat idea to me. It’s also the first story I’ve worked on in quite a while that is totally separate from the F.E.D.s. Usually when I do a story for an anthology title, as I have for the SPACE anthology the past two years, I do some super-hero idea that doesn’t quite fit in the F.E.D.s but I want to get out of my head and onto paper. By the way, the SPACE anthology is full of great work by lots of creators. The thing that makes such projects fun is the variety of works you get within. 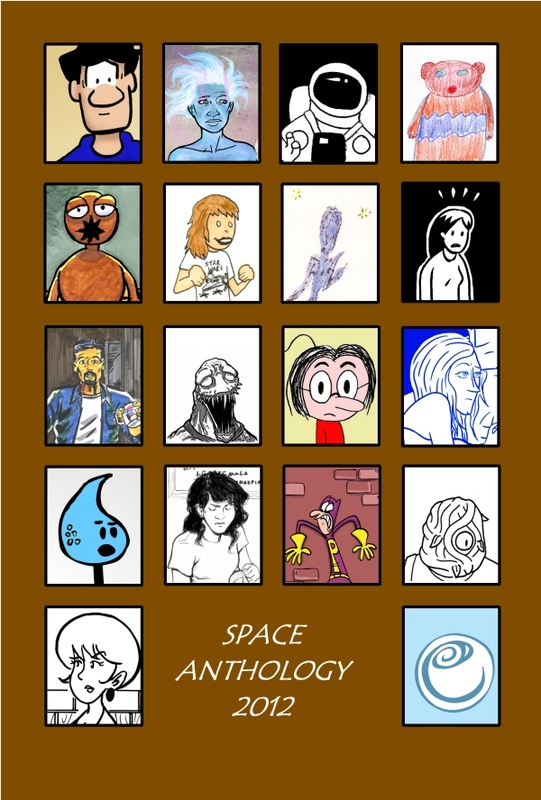 The SPACE anthology acts as a promotion for the SPACE convention (the Small Press and Alternative Comics Exposition), but also allows artists to showcase their works to those of you who won’t be able to attend the SPACE convention in Columbus (April 21st and 22nd). After you look at the anthology, be sure to check out the websites for the various creators involved. And if you check back here in the following weeks, I’ll be sure to post some reviews of the work in the SPACE anthology! If you don’t watch the web series Out With Dad, you might find this post a bit difficult to follow. But even if you choose not to watch the series, I hope you’ll stay to the end, because I think there’s a universal quality to my mental meanderings this week. I noticed looking at comments online concerning episodes of Out With Dad that many viewers make negative remarks about Vanessa. The comments concern how mean Vanessa has been at times towards Rose and how it would be better for Rose to just forgot about Vanessa and moved on to pursue another girl (Ah, if only our hearts worked in such a way…). While I do think there’s cause to be upset at Vanessa, I don’t think she’s a character that should really be hated. I think she’s a character for which you should feel sorry, or pity. To explain my thoughts I think first we need to compare Vanessa and Rose. Rose struggles a lot with life and the hand she has been dealt. It isn’t easy being young, being raised by your widowed Dad, being shy, being different from those you see around you, and being attracted to a person who refuses to love you back. Though the thrust of the series involves Rose’s sexuality, this is just one of her challenges. But as I watch Rose, I have no doubt that, despite it all, she will-somehow- manage to end up okay. Maybe everything won’t work out as she hopes, but in the end, she’ll be all right. My belief of this is because she has, via just two people, an awesome support system. Her father and her best friend Kenny give Rose the unconditional love and support that she needs. They aren’t perfect, but they will always be there for her. Vanessa, with her much larger family unit, does not have this kind of support. Her father is weak, her mother is controlling, and her younger brother is too young to understand her plight. The two people that could understand her situation the most, Rose and Vanessa’s older brother, are forbidden to be near her. Vanessa is the type of young person that, lacking a good support structure, all too often ends up doing something self-destructive as a way to deal with problems. I don’t think writer/director Jason Leaver will do anything too extreme with Vanessa’s character. But we do see this in real life all too often. Especially with young people and many times involving teens who are dealing with their own sexuality. Reflecting on this makes me want to make the world better. I don’t have an answer that will suddenly solve everyone’s problems, but I do think one thing we should all think about is just being nicer to each other. Supporting people and being understanding of people who are different from us can go a long way. Reach out a hand to someone who might need a little support. And stand by those who do go out of their way to help others. And finally, I hope everything works out for Rose and Vanessa. Just like I want everything to work out well for everyone in the real world, too. And allow me one minor postscript: If Rose and Vanessa don’t end up together, at least I feel confident Rose will find happiness someday. After all, how many of us marry the person we were in love with when we were fifteen? First thing today is the new look for my blog. I thought I’d try it out and see if I like it. The first thing about the new look I’d like to point out is the buttons beneath the posts. These buttons allow viewers of my blog to give immediate feedback and sharing. The +1 button gives a plus to the post’s counter and adds the profile picture and name of the person who clicks the button will appear. The other buttons allow sharing on Twitter and Facebook. The other neat feature is in the upper left corner. By mousing over the leftmost portion of the black bar (where it says “classic”) you can choose the way you want to view my blog. My favorite is “flipcard” which shows threads with pictures and titles. Try it! Next I thought I’d mention Straw Man issue 10. Straw Man is an independent comic written and drawn by David Branstetter. It’s about a super hero with no super powers. It’s hard to describe but it’s really fun. Straw Man issue 10 includes the work of 9 other independent artists. To publish Straw Man #10, David has started a kickstarter campaign to raise funds. You can check out this campaign here and you can find out more about Straw Man here. Maybe I’ll color it someday! Finally this week, I noticed when reconfiguring my blog that my post from last week (this one) has over 200 views! That’s record for this blog, and that’s in the first week! Thanks to everyone for reading my modest words and opinions. First thing: in this review of Out With Dad episode 2.07 I’m going to spoil the entire plot of the episode, so if you haven’t watched it, go to here, watch it, and come back and read my review. I think you will find it worth your time. To an extent, Out with PFLAG was what I was expecting it would be. By this, I mean I am somewhat familiar with the type of support group meeting depicted in this episode (I took some counseling classes years ago.) 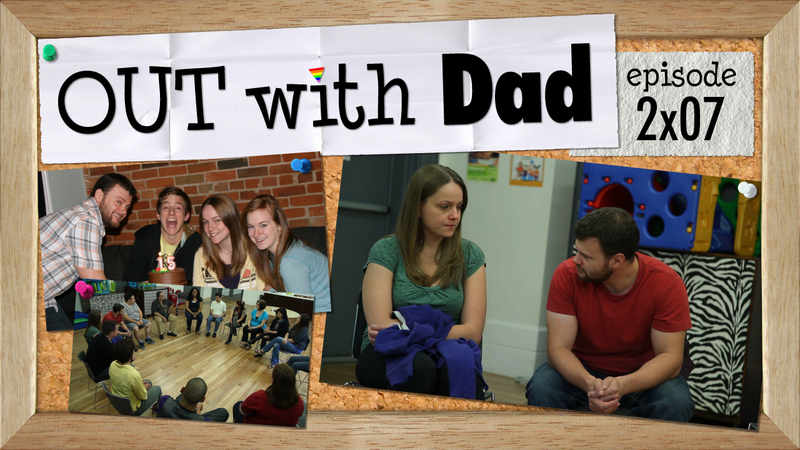 and I knew there would be stories based on real experiences of viewers of Out With Dad. I also figured out the “girl from the washroom” would be at the meeting. Yet despite this episode meeting certain expectations, I think it was one of the most heart-wrenching episodes of the series. 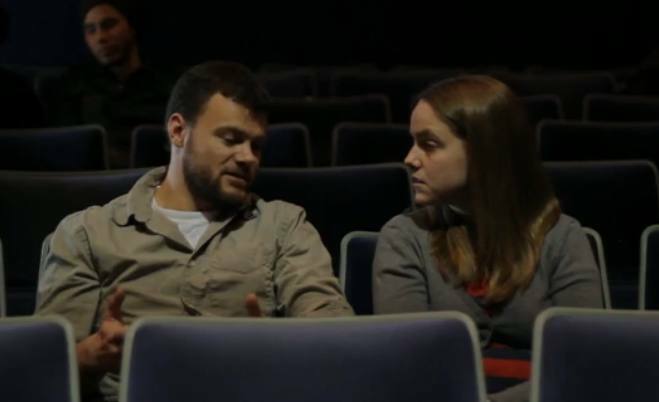 The viewer-submitted stories that were dramatized were the types of situations that are far too typical for people who are homosexual. There are far too many barriers in our western society for people who are “different” and these stories also remind us that in other societies things are worse. Much worse. I applaud the people who submitted stories to writer/director Jason Leaver for inclusion in this episode. Sharing such life events can be wonderfully informative and helpful to others, and it also takes a lot of courage to speak up about such events, especially when they are not about the happiest times in your life. Seeing and hearing from Claire was an excellent development. Her story puts her character in an interesting position of being the middle between Rose (supportive parent) and Vanessa (non-supportive parent). I am very interested as to where Claire’s character will go in the future. I’m sure there are fans that are screaming for her and Rose to develop a romantic relationship. Right now, I think a friend going through the same thing she is would be nice. And about Morgan, the final speaker before the end of part I. I don’t know if I can articulate my feelings. I know this is a fictional account, but I also know there are so many abused kids in the real world, and sexuality is one if the things kids get assaulted for. I’m sad but I’m also angry. I’m very angry that people can do such evil and that other people, by their own stupid words and deeds, encourage abusive behavior towards people who are “different”. Kate Conway did an excellent job in her portrayal of Rose in this episode. And she did it with mainly body language, as Rose doesn’t have many lines this time. The mannerisms of Rose really show how shy and unsure of herself Rose can be. It’s easy to see what she’s thinking as she reacts to the other members of the group telling their stories at the meeting. Will Conlon also did a top job with just body language. I can imagine Nathan wondering if bringing Rose to this meeting was a good idea. It’s certainly good for Rose to see that there are other people who have gone through or are going through similar situations as hers. However, some parts of the stories are scary, especially to a shy kid who has just discovered her sexuality. But the negative stories should also remind Rose of one thing: she’s not going to have trouble with her parent not accepting her, even if she encounters other people who do not accept her. The biggest strength of this episode, as with the series, is the writing. Jason Leaver tells a tale that makes the viewer care about the characters. And, like always, I end up thinking a lot about the circumstances in the episode. It’s what I like the most about this series: it makes me THINK! And hey, there’s about a month to go until the next episode. Which gives me some time to think. Maybe I’ll finish my other Out With Dad-related posts I’ve been working out.